Explanation: On October 7, the early dawn over northern Sudan revealed this twisted, high altitude trail. Captured in a video frame, the long-lasting persistent train is from the impact of a small asteroid cataloged as 2008 TC3. That event was remarkable because it was the first time an asteroid was detected in space before crashing into planet Earth's atmosphere. In fact, after astronomers discovered 2008 TC3, the time and location of its impact were predicted based on follow-up observations. Later, the impact predictions were confirmed by sensors, including a Meteosat-8 image of a bright flash in the atmosphere. 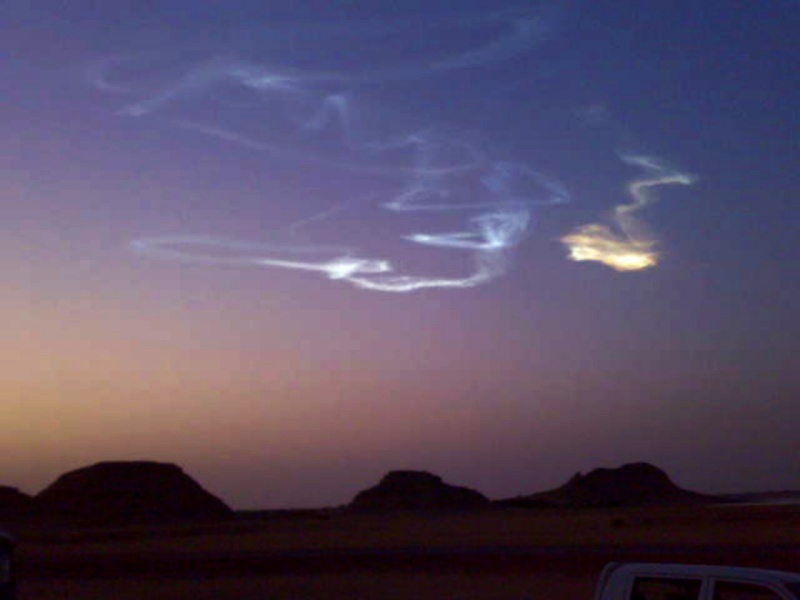 Astronomers are now hoping for more reports of local ground-based observations of what must have been a brilliant meteor streaking through Sudan's night sky. Additional reports could improve the chances of recovering meteorites. Take a survey on Aesthetics and Astronomy.